Currently, atomic force microscopes (AFMs) are one of the most widely used tools for imaging, measuring, and manipulating matter at the nanoscale. One of the key components of an AFM is a microscale oscillator, which scans the topographical features of a sample. Unfortunately, however, the fabrication of microscale oscillators is a complex and expensive process. In a new paper published in Nanotechnology, a team of researchers from the Laboratoire de Physique Statistique at the École Normale Supérieure, CNRS, in Paris, have demonstrated that a 7-centimeter-long aluminum tuning fork can replace the microscale oscillator in an AFM, and still produce images of nanoscale resolution and equal quality. "By analogy, to feel a roughness of 100 nm with an instrument 7 cm long is like feeling the thickness of a virus under the antenna of the Eiffel tower," coauthor Antoine Niguès at the École Normale Supérieure told Phys.org. "Moreover, the use of this large tuning fork considerably reduces the manufacturing costs of the AFM and greatly simplifies its use." In addition, the modified AFM, which the researchers call "MicroMegascope," can image objects that are immersed in liquid without any loss of quality, and without requiring any adjustments. This is a big advantage over conventional AFMs, which suffer from reduced image quality and require alternative probes to operate in liquid environments. Ever since the AFM was first invented in the mid-'80s by IBM scientists Gerd Binnig, Calvin Quate and Christoph Gerber, it has become a standard laboratory tool with a wide variety of applications, from condensed matter to biological matter. An AFM creates a topographical map of an object's surface by scanning the micro-oscillator over the surface. As the micro-oscillator approaches the surface, interaction forces between its tip and the sample induce changes in the mechanical motion of the oscillator. By measuring these changes, the topography of the sample can be reconstructed with nanoscale resolution. The MicroMegascope works in much the same way as a conventional AFM, except that it uses a centimeter-scale tuning fork as the oscillator. The relatively large tuning fork, which has a sharp tungsten tip glued to the end of one prong, essentially behaves as a mass-spring system. An accelerometer glued to one prong measures the tuning fork's acceleration, which is directly proportional to its oscillation amplitude. 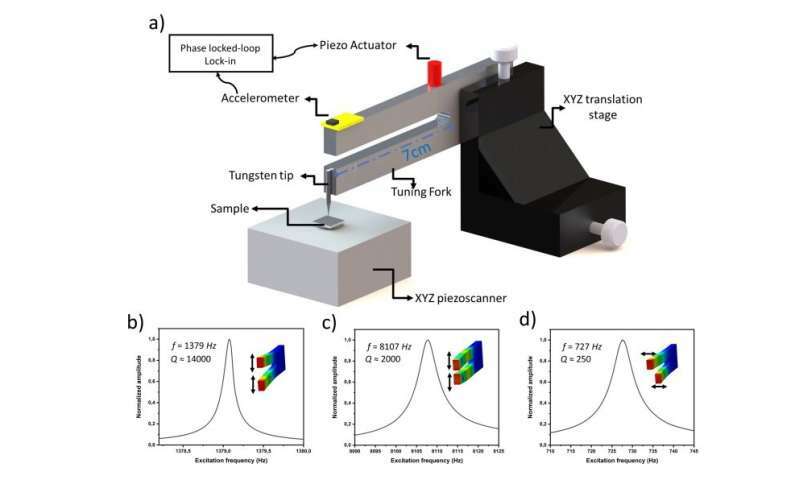 The researchers demonstrated that, despite the large size and mass of the tuning fork, images obtained by the MicroMegascope have comparable quality as those obtained by conventional AFMs, without the formidable fabrication challenges. The researchers hope that, in the future, the MicroMegascope will further extend the versatility of AFMs. Due to the larger size of the oscillator, it's possible to attach not only nanoscale tips but also, for example, macroscopic spherical tips. In addition, the oscillator has a greater stability, along with the ability to operate in high-viscosity liquid environments. All of these abilities may open the doors to new imaging applications. "We are already using the MicroMegascope to probe fundamental forces at the nanoscale and measure their impact at the macroscale," Niguès said. Congratulations to the researchers for advancing AFM after almost 40 years. But it seems MicroMega suffers as a self contradicting term. There are better words to use. Body dynamics, continuous ping. Structure initial conditions? So you will not see ? It could open the path for DIY construction of atomic force microscope by various amateurs with Arduino and similar tools. Tungsten tips https://aip.scita...de=rsi). Why? Create the image with Logic, math, ObjMem, ..
Somethings you must perceive intellectually; ex. unobservables! AFM was built on a kitchen table for peanuts. Then the tech companies got hold of it, started charging six figures for them. Don't worry. They'll figure out a way to preserve their outrageous margins again.